The Transport Accident Commission (TAC) in Victoria, Australia, is working with the Victoria government to run “Towards Zero”, an integrated advertising campaign asking Victorians to consider what it would be like to lose their loved ones on the roads. 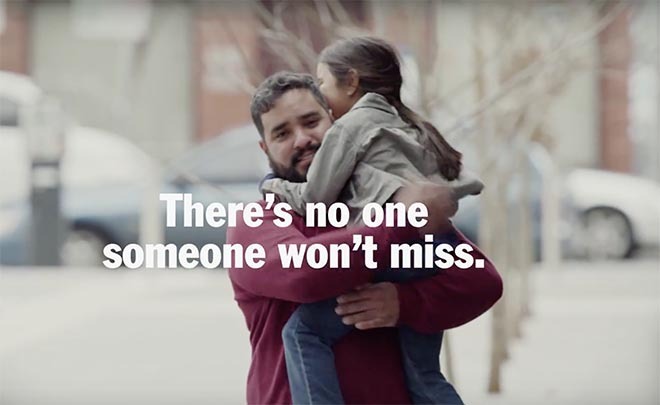 At the heart of the campaign is a television commercial in which Francisco, a Melbourne local, is surprised to see 70 members of his family appearing to represent his estimate of an acceptable annual road toll. “There’s no one someone won’t miss”, the tagline of the campaign, challenges viewers to work towards a road toll of zero. The star of the commercial, Victorian local Francisco Cerros, is asked the question: ‘Last year 249 people died on Victorian roads. What do you think is a more acceptable number?’ His answer is 70. Cerros is not an actor and he was not prepared for the sight of 70 of his closest family and friends walking around the corner. In an unscripted response, he is moved to tears before changing his answer to zero. The TAC Towards Zero campaign was developed at Clemenger BBDO, Melbourne, by executive creative director Ant Keogh, creative director Stephen de Wolf, art director Luke Thompson, copywriter Jim Robbins, planner Matt Pearce, director of design Jake Turnbull, agency producer Emma Johnson, agency producer (print) Nicholas Short, executive producer Sonia Von Libra, senior agency producer (digital) Ben Crowe, account manager Lee Simpson, group account director Naomi Goring, account director Kate Joiner, senior account manager Jarrick Lay, working with TAC road safety manager Sam Cockfield. Filming was shot by director Jonathan Kneebone via The Glue Society with producer Helen Morahan and director of photography Ryley Brown. Editor was Mike Lutman at The Butchery. VFX were produced by Flame artist Eugene Richards at The Refinery. Sound was designed at Flagstaff Studios by sound designer/engineer Paul Le Couteur with producers Sally McManus and Ceri Davies. Music was composed and arranged by Rob Law.